Myself seen by William Burroughs, Kodak Retina new-bought 2’d hand from Bowery hock-shop…, 1953, printed 1984-97. National Gallery of Art, Gift of Gary S. Davis. Images © 2012 Allen Ginsberg LLC. All rights reserved. 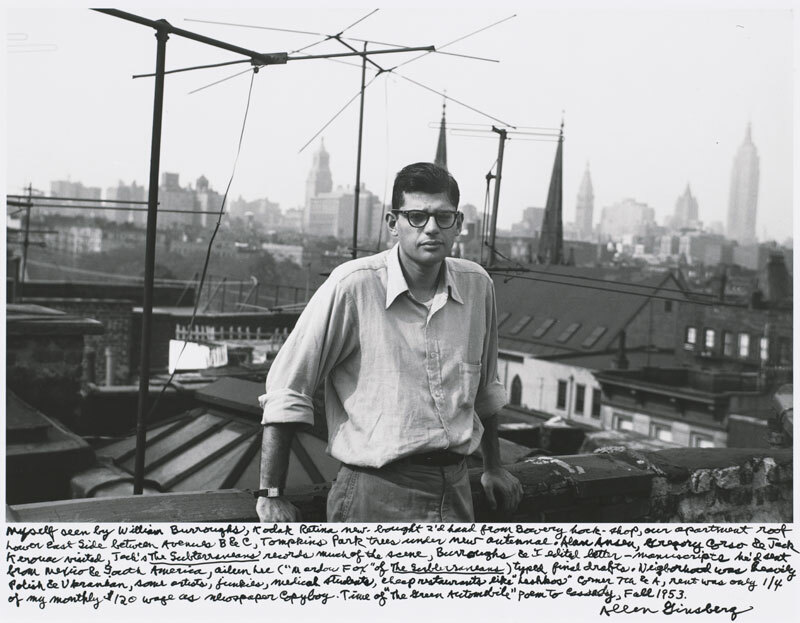 Walking through the Grey Art Gallery’s show Beat Memories: The Photographs of Allen Ginsberg is pretty much a stroll through the neighborhood circa 1953 – Tompkins Square Park, Avenue B, three-room apartments for $29 per month. This incredible tribute to all things Beat was initially mounted by the National Gallery, but the best place to see it is NYU’s gallery in the Village, just steps away from where it all happened. Get to Washington Square to see what it was like to be young, broke, ambitious, and at the edge of a generational shift in America. Allen Ginsberg had just gotten a $13 Kodak camera in a Bowery pawnshop and began taking photos of himself and his friends – Jack Kerouac, William S. Boroughs, and Gregory Corso. No one was famous yet. About thirty years later, Ginsberg found the snapshots, printed and enlarged them, and wrote in the margins his memories of sharing the flat, living on nothing, and breaking the rules. The photos tell quite a coming-of-age story – the first publication of Howl, Ferlinghetti’s bookstore in San Francisco, emerging Beat sensibility, and life in a flat at 206 East 7th Street while Kerouac took to the road. The earlier photos were all taken from 1953 to 1963, but later photos of his from the 1980s include Dylan, Larry Rivers, Francesco Clemente, and even Madonna. As an extra bonus, Grey Art Gallery interns developed a walking tour of Ginsberg’s East Village haunts, so you can actually experience Café Reggio, Café Wha?, and over 25 other spots where it all took place. Download the PDF tour inside the Beat Memories site and walk the walk of literary and cultural rebellion. This entry was posted in Art, History, Museums and tagged art, culture, history, museums, photography by mssusanb. Bookmark the permalink.